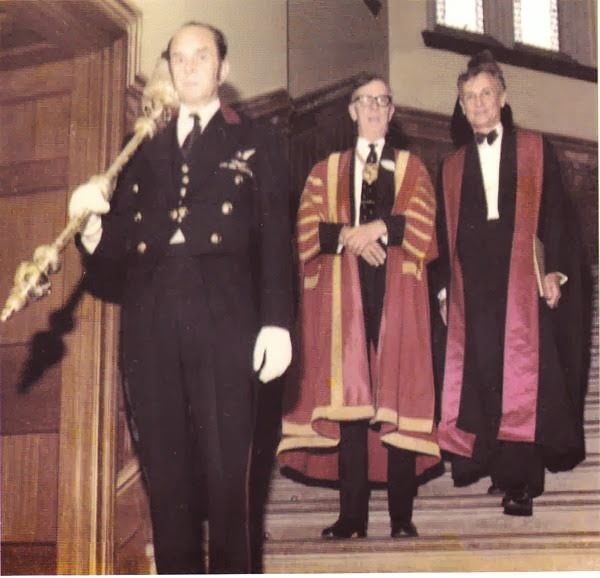 A decade after that drubbing, my father's still trying to falsely claim credit for inventing the Reversed Gastric Tube operation (RGT) to replace a damaged esopahagus. Click here for an e-mail I received from Lisa Michalski, Senior Publicist at Prometheus Books, that includes my father's version of events about the invention of the RGT that's slated to be published next week in his autobiography, Heimlich's Maneuvers. Dr. Dan Gavriliu died in 2012 at the age of 97. Without question, he deserves credit for being the first surgeon to discover and perform the procedure that would become known as the Heimlich-Gavriliu Reversed Gastric Tube operation. One hand giveth while the other hand taketh credit -- and putteth his own name first. Still, I am proud of the fact that I was the first surgeon in the Western world to perform the reversed gastric tube operation. The first doctor to use the gastric tube in North America was Dr. James Fallis from Canada. The Genius of a Romanian Surgeon is Recognized, ZIUA, April 1, 2006, which includes an interview with me. ...Professor Dan Gavriliu receives the monthly equivalent of about 250 (US) dollars. And a not unimportant detail, Dr. Henry Heimlich is a multimillionaire. 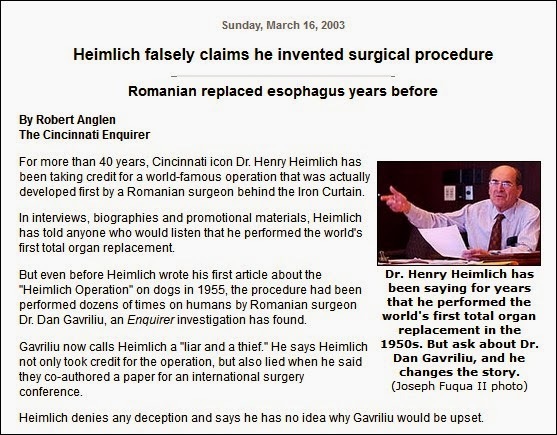 I've just learned that Prometheus Books is about to publish an autobiography of Dr. Henry Heimlich, who is famous in my native Romania not for his choking maneuver, but for trying to steal credit for the RGT surgical procedure from Dr. Dan Gavriliu. I'm afraid not only the paternity of this procedure has been established beyond any possible doubt, but also the fact that - for decades - Dr. Heimlich disingenuously posed as its inventor (for American audiences, at least). As a journalist, I've documented the whole affair back in 2006. You can surely understand my interest for the way Dr. Heimlich's autobiography is dealing with this shameful episode. Dr. Gavriliu might be now dead, but his legacy is not at all forgotten. In Europe (and anywhere else except for the US) there never was a Heimlich-Gavriliu procedure. Dr. Heimlich was just one of (approximately) 60 foreign surgeons allowed in the 50's to assist Dr. Gavriliu while performing his innovative RGT procedure. He might have been the first American to perform it after seeing it done in Bucharest, but this gives him no right to name it. To continue to fraudulently attach Heimlich's name to Gavriliu's is highly offensive. I hope the book you are about to publish will not perpetuate this injustice. I'm looking forward to reading it. As of last night, she hasn't received a reply. Click here for Part I: Publishers Weekly and Kirkus get it wrong, then update their reviews of my father's memoir to credit Dr. Dan Gavriliu.